This entry was posted on November 1, 2018 by Magnattack. The revolutionary Mag-Ram™ Automatic Self-Cleaning magnet going strong and getting stronger! 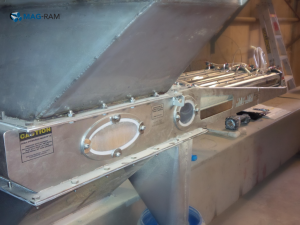 Since 2008 to the present day the Mag-Ram™ Automatic Self-Cleaning Separator has (and will for many years to come) provided food manufacturing companies with continuous, around-the-clock, foreign metal fragment control and risk reduction. 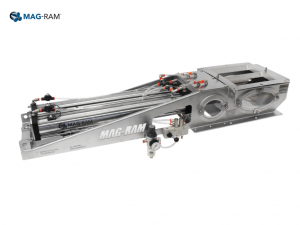 The Mag-Ram™ is extremely beneficial in the way its magnet bars, or 'Rams', can self-clean during production runs - meaning that the process doesn't need to stop and clean magnets are presented to the product flow at all times! The first Mag-Ram™ was engineered for a large ship loading facility on large tonnages of grain, in 2008. This quickly became recognized and sought after in the grain industry, developing into a highly regarded and sought after solution in abrasive grain applications. 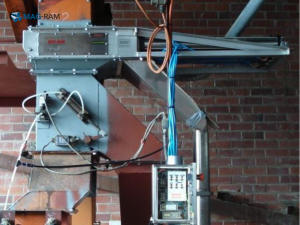 One of the first Mag-Ram units, installed at an Aussie brewery. 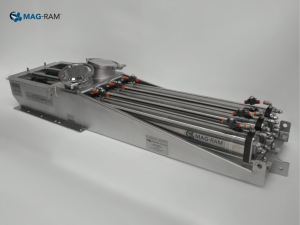 An early Mag-Ram Self Cleaning Separator, manufactured for a high-tonnage shipbuilding facility in South Australia. 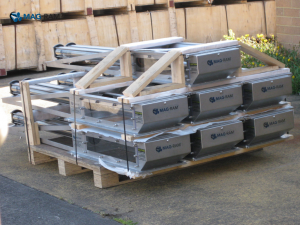 7 Mag-Ram Separators prior to delivery to a cereal manufacturer. 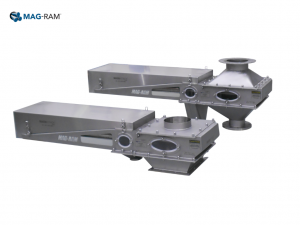 Since then, the Mag-Ram™'s versatility has allowed it to easily transition into many industries including dairy/pharmaceutical powders, pet food, rendering/meat proteins, flour, cereals, and bulk wheat. The Mag-Ram™ carries HACCP International certification and is fully compliant with HACCP International Food Safety Standard 0909MAGSEP 1-2010. In 2015, the Mag-Ram™ received USDA Dairy Acceptance, which gives dairy and pharmaceutical companies the assurance of hygienic magnetic separation. 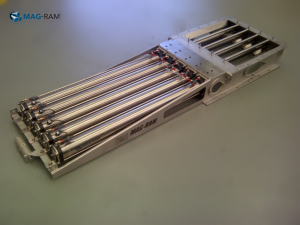 A Mag-Ram prior to shipping to New Zealand. A Mag-Ram installed in a sensitive dairy application. 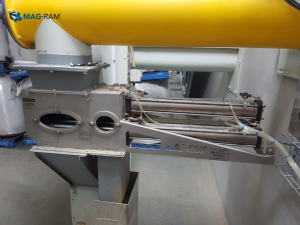 A Mag-Ram installed in an oats milling facility. We recently caught up with one of our first Mag-Ram™ clients who said that "the Mag-Ram Self-Cleaning Magnet is a very beneficial, reliable, and effective contribution to risk reduction, assisting us to control our metal concerns...a worthwhile investment and very innovative design." Over the past decade, other Mag-Ram™ customers have reported positive feedback and negligible maintained requirements. This feedback is invaluable as it not only assists Magnattack Global in further Mag-Ram™ developments, but it also gives future clients peace-of-mind of effective and reliable foreign metal fragment control. "We found a solution that exceeded our expectations by installing a Mag-Ram Self-Cleaning Magnetic Separator." "The Mag-Ram was instrumental in securing a long-term client that was very close to dropping us due to a number of contamination issues." "When we looked around at all the options we found that the Mag-Ram was the best because it is self-cleaning and it saves operators time and it gives us the assurance that we’re not sending metal to our customers." 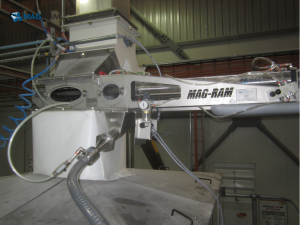 "Magnattack™ offered to trial one of their Mag-Ram™ self-cleaning systems and as a result we have changed most of our dry powder units for their solution. The leakage problem is resolved, and we have a more ideal means of collection of metal fragments." A Mag-Ram installed in a high-tonnage grain application. 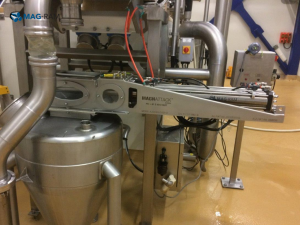 A Mag-Ram Self-Cleaning Separator installed in pet food. "This has provided the separation qualities required and the assurance that a clean magnet is presented to the product with regular cleaning cycles. 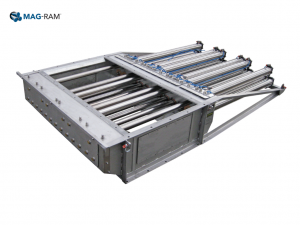 The most innovative function of this unit is its ability to clean one ram at a time providing good coverage of product to magnet during its cleaning cycle." "We have been working with Magnattack for the past decade and have installed multiple Mag-Ram self-cleaning grate magnets throughout our plants. These units have proved very useful in reducing downtime caused by damage to equipment, as well as a huge timesaver for operators cleaning magnets." "I have only got good things to say about how the MAGRAM performs". It has been a great investment which has undoubtedly proved its worth over nearly 3 years. There has been negligible maintenance. Another USDA-Dairy Mag-Ram prior to shipping. 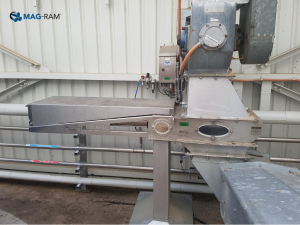 A Mag-Ram in a rice facility in rural New South Wales. 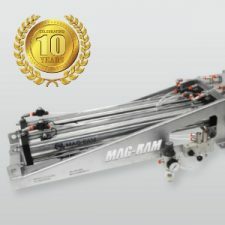 Moving forward, the Mag-Ram™ is proving beneficial and is gaining attention in several key industries across America, Australia, and Europe, where the unique and robust design has provided solutions to long-standing mechanical problems with conventional self-cleaning magnets. More information on the RE80 Mag-Ram™ Self Cleaning Magnetic Separator can be found here. Magnattack Global manufacture and supply RE80 +11,000 Gauss Magnetic Separation Systems specifically for the food industry. Do you need maximum foreign metal fragment control and risk reduction? Contact a Magnattack technician today! Congratulations! Hopefully MagRam continues to see success as this great magnetic separation industry continues to grow!